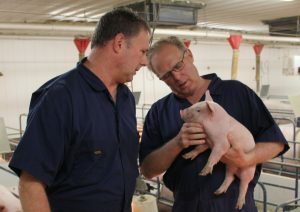 Minnesota Pork - Pig farmers taking care of pig, people and the planet. In addition to Minnesota pig farmers, raising pigs creates an additional 44,000 jobs like construction, trucking, feed milling, accounting, food processing, etc. 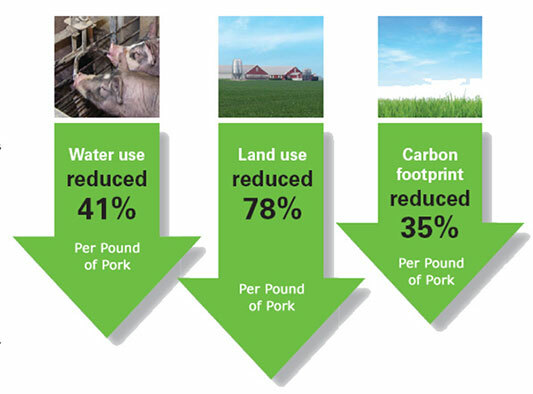 Over the past 50 years, U.S. pig farmers have made great strides in sustainability. Farmers are committed to the care of their animals throughout every stage of the pig’s life. Pigs are fed high-quality diets that meet their nutritional needs. Farmers work with veterinarians to make decisions on providing pigs antibiotics. Antibiotics are used only when it benefits the health and well-being of the pig. All health care products used on pig farms are Food and Drug Administration approved. Hormones are not approved for use in pigs raised for meat. Therefore all the pork you buy at the store is without added hormones. All pork contains natural hormones that are found in the pig’s body. Individuals who provide daily care to pigs and those who transport live pigs take part in Pork Quality Assurance Plus® (PQA Plus®) and Transport Quality Assurance® (TQA®) trainings. PQA Plus® and TQA trainings® teach best practices for managing pigs, the proper use of health products and techniques to assure pig well-being. The PQA Plus® program offers a process for third party, on-farm evaluation of pig health, barn conditions and record keeping procedures.